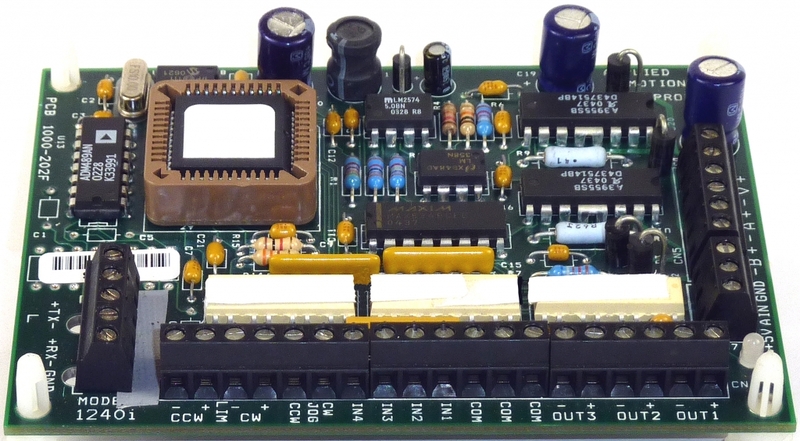 The 1240i-485 is a step motor drive with on-board controller designed for use in applications that require streaming serial commands to one or more drives over an RS-485 serial connection. The drive provides up to 48 Watts of power to the step motor. The 1240i-485 comes with an RS-485 port instead of the RS-232 port on the standard 1240i, enabling multiple 1240i-485 drives to be used in a multi-drop serial network in which a host PC or PLC commands the drives using SCL commands. The 1240i-485 includes eight (8) optically isolated programmable inputs for triggering, branching, position sensing and end of travel detection. Three (3) optically isolated programmable outputs can send signals to other electronic devices and activate relays. Note that the 1240i-485 does not support the Si Programmer™ Windows software. If your application requires stand-alone programming using Si Programmer™ see the standard 1240i drive.